The first rule of storm chasing is, hop out of the vehicle, get the photos, and videos because that is what people do, said storm chaser Mickey Smith. 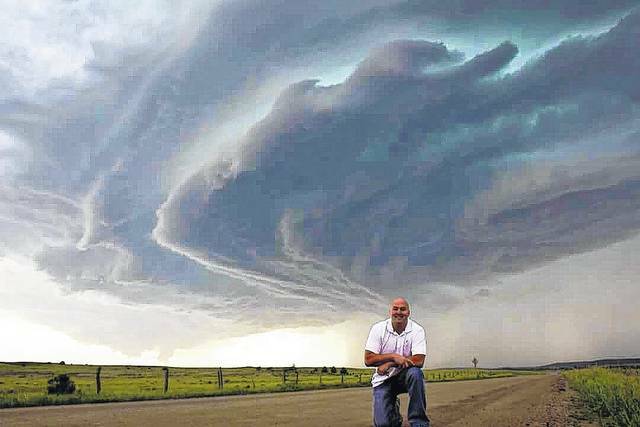 In the photo, Smith is posed in front of a storm from a chase in Hulet, Wyoming in June of 2104. “As a kid I was deathly afraid of storms,” said Mickey Smith. Now when he’s on vacation, he spends his time chasing tornadoes. Smith is a firefighter and paramedic with the Liberty Township Fire Department and a self-proclaimed member of the “zero meter club,” meaning he’s someone who has come as close as humanly possible to a tornado and gotten back out without being hurt. When Smith decided to face his fear of storms, he said he just jumped right in by doing a quick search on the internet. Smith said it was an 11-day chase through several Great Plains states that put him in the middle of the largest outbreak of tornadoes in 100 years. He said there were 35 tornadoes reported over a four-day period. The outbreak Smith found himself in was the June 16, 2014 devastation of Pilger, Nebraska, when twin tornadoes hit the small town that had a population of 340. After spotting the tornado, what came next really surprised him. The group was caught between twin tornadoes. As if things couldn’t get worse for the group, the lead van became stuck and disabled, Smith said. He said the van had to be emptied and everyone had to pile into the remaining van. Smith said they were so close to the tornadoes that their ears popped. Smith said the group was based in Denver and drove wherever the storms were. Smith said the people directing the chase knew where the storms were going to be and it was just a matter of getting to them. This entry was tagged delaware, Liberty Fire, Smith, tornado. Bookmark the permalink.